After paying a charitable visit to a poor sick family and witnessing their wretchedness, Emma -- the heroine of Jane Austen's novel that goes by the same name -- and her friend Harriet discuss the impact the experience has had on them and how they cannot possibly think of anything else after that sight. They claim to be so affected by what they have seen, that they cannot dwell on the insignificant things that used to occupy their thoughts. Emma: "...And really, I do not think the impression will soon be over.... I do not think it will." But as the two girls spot Mr. Elton, the object of Harriet's affections and of Emma's matchmaking hobby, all noble and lofty thoughts fly off on the breeze, and their assurances are nothing. Mr. Elton takes over every single conscious thought of theirs, and all their passionate exclamations of how impossible it would be to think of anything else but their visit have become meaningless. They care no more about the wretched family they had just visited, for their admiration for Mr. Elton rises above everything else. How soon we too forget about the things that move us! We go through an experience, vowing never to forget it, resolving to change our lives because of it, believing we will never go back to our old selves, but those resolutions and noble thoughts are abandoned in the blink of an eye. Each year, as we wait to be judged on Rosh Hashana, we resolve to be better this year. Some people take upon themselves to do something more in the upcoming year in order to make a difference and to be better. We assure G-d that we are quite done with our evil ways and will act differently this time around. Year after year, we say this as we ask G-d for a good year. Many of these new resolutions we will abandon after only a week, shrugging it off by thinking, "Well, it doesn't really matter. G-d will understand." But how foolish must it seem to G-d to hear us assuring Him of how well we will behave and all of the good things we will do this year and then see us, our memories completely blank, going back to our old ways and defiantly repeating all our past mistakes just because we find it too hard to keep our promises. When the Jews were wandering around in the desert, they complained about their situation and questioned G-d, even after the miracles they witnessed at Mt. Sinai, which was so great that it should logically have changed their lives forever. We learn that there was a group of people who did not take that experience to heart. They saw, they heard, they felt, but they did not let it penetrate their hearts. They were, perhaps, inspired for the moment, but they did nothing about it. They made no attempts to make it a part of themselves or to make a commitment. So that inspiration that struck them at that moment was lost soon after, and they went back to defying and questioning G-d. When we are inspired by something, when our minds are focused on this inspiration, we should do something to make it a part of ourselves. On Rosh Hashana, we are inspired by the thought of being judged, and it drives us to repent and to make resolutions for the coming year. But when Rosh Hashana and Yom Kippur are over, we more often than not are relieved that it is over so we can go back to our regular lives. That is what makes us stumble -- we only act on our inspiration when it strikes us, instead of holding onto that inspiration and not letting go of it from year to year. May our inspiration this Rosh Hashana be real and may it remain with us until the next Rosh Hashana, influencing our thoughts and our actions. I have been thinking of a few blog posts I wanted to make before Rosh Hashana, but it seems as if I will start off with something completely unplanned. I was tagged by BTS for the superpower meme, which I see almost everyone has already posted by now. This is one of those memes that I just feel useless in attempting. I mean, I've gotten the hang of life. I know for the most part what my abilities are, and I try to use them to the best of my ability. I used to spend a lot of time dreaming about a more ideal me and a more ideal world, in which I would be capable of knowing and doing more. Daydreaming is a powerful thing -- it sometimes convinces you that impossible things are a reality, and although you consciously know that it is impossible, there is still this small subconscious part of you that says, "It's true, it's possible, this dream can be a reality." The descent to earth and to true reality then becomes even more difficult when it must be done. So I try not to dwell on the abilities I only wish I had. I want to make the reality work. Perhaps that is why when BTS tagged me, my first reaction was, "Oh no, not this meme. I don't want superpowers. I just want to be the best that I can actually be." If I had been asked this as a child, I would immediately list a dozen superpowers I would like to have. But now, it is not at all something I would want. So while I am still doing this meme, it is going to be less about 'superpowers' and more about actual abilities. Since Rosh Hashana is coming up, the correct thing to say would be to say something nice and fluffy about how I want to be a perfect Jew and be able to immediately know what is sinful and what is not and to refrain from sinning. But I'm not going to say that, because perfection does not appeal to me. I suppose that the ability I would most like to have would be to understand people and their motives thoroughly. BTS wrote that he would like to have organized information on every single person, and BoSD wrote that she wants to be able to "get a glimpse into the minds of other people" so she could understand them better, be more sensitive to them, and not hurt anyone unintentionally. Shlomo's post was along those lines as well, although he went off on a tangent about Jews and Nietzsche, and when he finally wrote what abilities he would like to have, it was to read minds and manipulate them. So we have the spy, the sweet blob, and the manipulative Israeli, all wishing for similar superpowers. And here enters the writer, with a similar wish, for completely different purposes. I would like to see people's intentions -- why they do the things they do. I would like to understand their thought processes, whether they lead to good actions or to crimes, and I want to be able to see the world from their point of view, so that I could create realistic, human characters based on them. I want my characters to have depth and complexity, so my readers should connect to them whether the characters are generally perceived by society as 'good' or as 'bad'. I suppose I want to do away with those terms entirely; I want my characters to be not good or bad, but human -- to be real, since that is perhaps one of the greatest things a writer can achieve. That sounds like it can be easily solved by majoring in psychology. The truth though is that although I can study psychology as much as I want, the ability to see every facet of a person's mind and heart is impossible for us mere mortals. So that is why I am writing this down as the 'superpower' I would most like to have. Subwife, because she sounds pretty stressed in her posts about work, and I would like to see if she wishes she could make people just disappear. Dina, because I would like to see what she would do to the world with her superpowers. Oh, and BTS asked when he tagged me, "so what did you write in your private diary today, Hannah?" 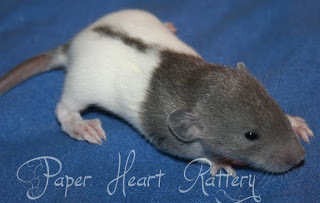 And here are the photos from the breeder. 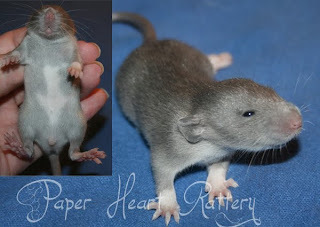 The first one is Darcy, who is a Russian blue agouti berkshire dumbo. Knightley, the second one, is a Russian blue agouti hooded dumbo. They are both friendly and social, although I would say that Darcy is the outgoing one of the two. He always greets me when I walk over to the cage, and Knightley usually joins in. They enjoy climbing (humans), perching on shoulders, giving soft, ticklish rat kisses, and exploring. I actually managed to get a wonderful photo of Darcy and me while he was sitting on my shoulder, curiously looking into the camera. Before each school year begins, I dream and make plans in my head, determined that this will be the year. This year I will be a perfect student. This year I will be successful. This year I will achieve straight A's. This year I will be the girl that comes to class every day prepared and ready to take in as much knowledge as I can and contribute something to the class in turn. I will be the student who has all her assignments done perfectly and on time, without complaint. This will be my year. The Golden Age of Hannah Rozenblat. And most years, I disappoint myself in some way or another. Perhaps I did not do as well as I could have, or I did not accomplish as much as I wished to when I started out the school year. Well, I thought to myself last night, as I went to sleep early to be ready for school this morning, This is my last year in this school. This is the last time I can start a year that way, with that drive and that enthusiasm I always felt at each beginning. But instead of feeling motivated and enthusiastic, I felt uneasy. I always thought I could accomplish it all and succeed if I just put in effort, but now I know that while I can be successful, I can never be a perfect student. There is no such thing as a perfect student, really. We can all strive for our own levels of 'perfection', but in the end, we're just good students. We are more knowledgeable, perhaps, after putting our efforts into our studies, we are more aware of the world around us and of everything in this world, and we might have the marks to prove it, but there cannot be a 'perfect' student. So as I started my senior year, I told myself that I just want to get as much as I can out of it, instead of seeking perfection. I want to give it my best -- or as close to it as I can without driving myself mad. This is my last year here. I want to make it count. I remember when I was in one of the younger grades in elementary school (perhaps in second grade) and I was thinking about how many years I had left. I had only just started, and the end seemed so far away to me. Twelfth grade was something so foreign I could not even imagine it, and I wondered if I would ever really get there, or if the years would pass by so slowly that I would feel as if I'd never be there. And at first, the years did pass by very slowly. I counted them down diligently. Another seven years to go until I am free. Another five years to go until I can leave. Just three more years and I am done. Oh, look, hey, I only have two years left! Time sure has flown.... And now, the countdown is down to one year. Except that I am not really counting down now, because I am not sure yet how I feel about it ending. Yes, I've waited for this year for so long, but now that I am here and I know that there is no looking back, I am somehow nervous. I suppose that is why I want to make the most out of this year. It is my last, and I don't want to look back on it with any regrets or memories of missed opportunities. So next time you hear me complaining about the heavy load of assignments or the amount of material I have to study for midterms or finals, kindly remind me of this. For all of you who have also started a new school year this month, I wish you the best of luck and lots of success! A few months ago, I discovered a fascinating and well-written blog titled The Curious Jew, written by Chana. I started going through her old posts, some of which she wrote when she was still in high school, and was impressed by her maturity, depth of knowledge, and her way of expressing herself. The posts in which she compared literature to Torah and blended the two seamlessly changed the way I read books and her posts on ideas in the Torah made me want to learn more. Each post of hers was like a class all on its own and was well worth the time it took to read it. So now that the time comes for me to nominate a blogger for the Nefesh B'Nefesh Second International Jewish Bloggers Convention, it is a rather easy choice to make. Or rather, it is an obvious choice. The blogger will be teamed up with an oleh/olah/family of olim and will have to get to know them and blog about them. Who can be better for the job than Chana, who is known for starting conversations with strangers and writing interesting, humorous, insightful posts about the experiences? She talks to people most of us would never even notice; we would probably walk by them, while Chana takes those opportunities to exchange a few words and put a smile on their faces. Her colorful accounts of those experiences are a pleasure to read (which is obvious by the many comments she receives and the general popularity of her blog). Let's not limit her to the New York crowd (as fascinating and diverse as it is). Let's send her to Israel! There, she will have the opportunity of getting to know those making aliyah, and judging by her previous posts over the past few years, she will be able to make an interesting story out of everything and everyone. So, those are my reasons for nominating Chana (Curious Jew) for this Nefesh B'Nefesh flight.